Wednesday 30th January – Masses at 6.30am & 9.30am; 7.30pm – Eucharistic Healing Service – Guest Speaker: Mr Mickey Harte (Tyrone GAA Manager). Thursday 31st January – Masses at 6.30am & 9.30am; 7.30pm – Eucharistic Healing Service – Guest Speaker: Mrs Marie Lindsay (Principal of St Mary's College, Derry). 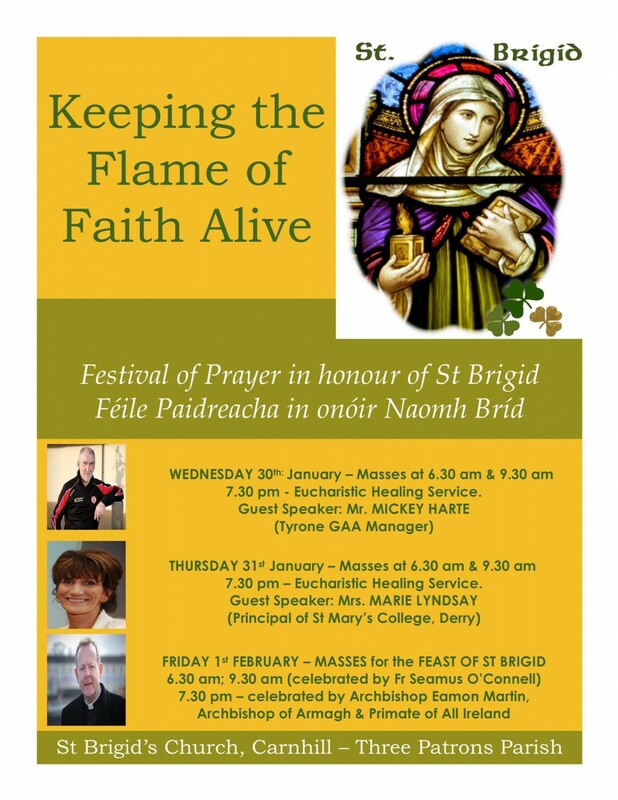 Friday 1st February – Masses for the Feast of St Brigid: 6.30am; 9.30am: celebrated by Fr Seamus O' Connell, P. Em; 7.30pm: celebrated by Archbishop Eamon Martin, Archbishop of Armagh and Primate of All Ireland. All Welcome!